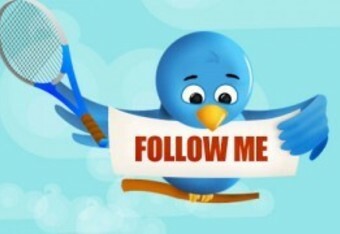 Part of the experience of following tennis – especially at the four major tournaments – is significantly enhanced by joining “Tennis Twitter,” the social media community that tweets about tennis. Every community has its flaws (because all human beings are imperfect), but Tennis Twitter is a delightfully diverse place in which a casual sports fan and a diehard tennis fan can both feel at home. Some people follow sporting events on Twitter for the humor; others for the information and links; still others for the live analysis. You’ll get all those kinds of people – and more – on Tennis Twitter. Various clusters of tennis tweeps fill needed roles, and this brief overview will offer examples of 20 different kinds of people (more precisely 18 people and two blogs) that add zest and texture to a tennis major. For many of these people, you can usually find a few more equivalent examples on Tennis Twitter. If full names can’t be identified, the Twitter handle is the first point of reference for the tweep. First or partial names are given in the descriptions, if available. There are fans of all the top players who live and die during major tournament matches. Their comments are sometimes over the top, sometimes even a bit outlandish… but almost always in a spirit of good fun. Few tennis tweeps manage to be outrageous and yet widely loved the way this man is. Why is Anton Skrzypiciel, a Federer devotee, able to interact with plenty of Nadal and Djokovic fans without being hated? He has a fascinating personal story for one thing, and in his line of work, he’s busy adding beauty to the world. There are no guarantees in life, but the chances are that you’ll enjoy Mr. Skrzypiciel on your Twitter feed. He’s anything but boring, and Twitter is a place where vibrant people belong. The longtime stats guru of the ATP Tour, Greg Sharko, is an excellent source of information on men’s tennis, but a more prolific tweeter is Josh Meiseles, who writes for the ATP’s website and pounds the pavement to cover men’s tennis at all levels of professional competition. Meiseles immerses himself in the sport and has his fingers on the pulse of what’s happening throughout the ATP Tour. He unearths various factoids about men’s tennis as well, but Chris Skelton has devoted a little bit more of his time over the years to women’s tennis. He currently works as the digital managing editor for Tennis View Magazine. When major tournament quarterfinals, semifinals and finals end, few on Tennis Twitter offer better in-the-moment statistics. There are matters of statistics, and then there are matters pertaining to analytics. Jeff Sackmann will give you plenty of stats, much as Greg Sharko and Chris Skelton manage to do, but he goes several steps further. Sackmann runs the blogsite Tennis Abstract and has devised a system for charting whole tennis matches down to every last detail. (A few researchers help him with charting and tracking, but he does a lot of the work himself.) You didn’t know tennis had a genuine analytics wizard, did you? Well, now you do. This is your go-to source for understanding tennis at an advanced numerical level. Few on Tennis Twitter exhibit more command of the tennis rulebook than Victoria Chiesa. She has written extensively on the hindrance rule (among other topics) and legitimately deserves to be seen as an authority on such matters. Chiesa is extremely knowledgeable about the sport at large and the WTA in particular — she’s one of the more informed WTA analysts around. For the purposes of this niche-oriented list, though, rules questions are her wheelhouse; Tennis Twitter would generally back up that assertion. Want to know the rules and policies regarding withdrawals just before tournaments? Does a so-called “lucky loser” get inserted into the draw? Is the draw remade? Does a qualifier become eligible to make a main draw match? Chiesa will keep you informed. When you can’t access either a television broadcast or a live stream and Twitter is your only way of getting live updates on a major tournament match, there’s a chance that Patrick can help you out, especially on the WTA side of things. “Ace,” as he his nicknamed, is practiced in the art of quickly compiling play-by-play notes during tiebreakers and giving scores during changeovers. He’s also informed on the nuances of scheduling in terms of both timeslotting and court assignments. Those are very specific services which come in handy over the course of a major. The full name is unavailable, but the value of the resource is substantial. This mathematician supports the “Spanish Armada,” but she also provides Spanish-to-English translations at times, and she links to both articles and videos that offer important information and perspectives on Rafael Nadal. This is a Spain-specific example of how Tennis Twitter reaches into different corners of the globe to enhance a tennis fan’s knowledge base. If you’re following tennis in this day and age, being able to gain perspectives from countries that haven’t always occupied the spotlight is something that can dramatically increase your level of awareness. Serbia hasn’t been a constant force in global tennis over many decades, but it’s enjoyed a period of prosperity over the past several years, thanks to the rise of Novak Djokovic and the emergence of both Ana Ivanovic and Jelena Jankovic on the WTA Tour. Ana Mitric is a Serbian tennis fan who provides links and perspective during the course of major tournaments and, for that matter, the tennis season at large. She’s someone you want to include on your short list of tennis follows… or a large list, depending on how many tweeps you want to bring into your timeline. Serbia is a country that has acquired a newfound place of tennis prominence. Spain, on the other hand, almost always has a handful of players in the spotlight (the 1980s being the one noticeably drier decade over the course of the past 50 years). It’s always good to follow a Spanish source of tennis information. Similarly, it’s always good to follow a French tennis voice. France is, of course, one of the four nations that hosts a major tennis tournament. It joins Great Britain, the United States, and Australia as one of the foremost tennis nations in the world since the modern game was developed in the 1870s. France might not have won a major men’s singles title since 1983 (Yannick Noah), but Marion Bartoli won Wimbledon last year before retiring from the sport. Moreover, France has several ATP players in the top 100. A part of the story of tennis is told in and through the stories of French competitors. Bouchard writes for L’Equipe, one of Europe’s foremost sports publications. Want a French perspective on tennis? This one won’t disappoint. There’s so much good tennis writing to be found on the web, and much as it’s necessary to follow at least someone from France and Australia (in addition to the United States and also Spain), you should follow at least one writer from Great Britain. Wilks, who writes for Live Tennis, is worthy of being seen as one of the more creative and stylish practitioners of her craft. A witty tweeter and elegant wordsmith, Wilks – who can write ably about both tours but has a little bit more to say about the WTA – will give you plenty to think… and laugh… about. Not limited to one nation or language, the well-traveled Nixon collects a lot of links and can translate in multiple languages. Some of his links provide a level of information not readily found in American tennis media. You’ll also get snippets of commentary, including analysis of Caroline Wozniacki when the high-profile Danish player takes the court. Nixon dramatically expands the world for anyone who is sincerely interested in learning about tennis as a global sport. A number of other tennis tweeps possess substantial knowledge of the WTA Tour, and of the Williams Sisters in particular. Of these tweeps, few tweet more consistently and authoritatively than Karen Williams, who writes about tennis from the Cayman Islands at her own blogsite, Overhead Spin. Master Ace, mentioned above, contributes to Overhead Spin as well. One particular part of Williams’s commentary that’s worth noting (and appreciating) is this: She highly admires sprawling, dynamic athleticism, specifically the kind found in an aggressive, attacking style of tennis. Williams’s perspective is just one of many in the vast world of Tennis Twitter. Just about every style of play has its own set of admirers, and as you build a Tennis Twitter list with an appreciable degree of diversity, you’ll soon see how opinionated tennis fans are. Different personalities and playing styles elicit a full range of sharply contrasting views on everything that’s good and bad about the sport. One of the better new tennis blogs to hit the web over the past two years is this one, co-founded by three excellent tennis commentators who have been published in high-profile publications such as USA Today and Bleacher Report (among others). Amy Fetherolf is innovative in covering tennis relative to analytics and statistical nuances, and the aforementioned Jeff Sackmann has been brought into The Changeover’s core team to bolster its analytics component. One of Amy’s two co-founders, Lindsay Gibbs, writes very thoughtfully about the sport, and is the author of one of the better tennis books from the past half-decade. The third co-founder, Juan Jose Vallejo, owns a delightful Bill Walton-like propensity to pull no punches whatsoever if a player makes a poor in-match decision. Give The Changeover a look if you want a fresh media alternative during a major tournament. America’s neighbor to the North is generally worth keeping an eye on, especially at a time when Eugenie Bouchard is emerging as a present and (likely) future force in women’s tennis. Milos Raonic hasn’t yet made a particularly deep run at a major, but he’s spent a good chunk of 2014 in the top 10 of the ATP Tour rankings. He also gave Novak Djokovic a strong test in the Rome semifinals on May 17. Myles, formerly of the Montreal Gazette, now maintains her own tennis blog, Open Court. She’s highly informed about tennis at all stages of the sport’s existence and development, from the juniors to the Challenger Tour level to the majors. She’ll be sure to cover the Canadian players who are trying to climb the ladder. Interested in tennis betting? This is the place to turn to. Jarrahi has a personal Twitter account and a betting-focused account for a blogsite called The Overrule. You expect a betting expert to know his stuff backwards and forwards; Jarrahi easily meets expectations. His command of subject matter is complete and wide-ranging. He is refreshingly realistic about explaining the limits of predicting outcomes in sporting events, yet he’s just as authoritative in illustrating why one given outcome is more likely than another. Jarrahi will also tweet about tennis media coverage if he’s in the mood to do so, and he doesn’t use kid gloves. Jarrahi provides no-nonsense, bracingly candid analysis, and that’s what any sport needs. Tennis, seen as a niche sport in the United States, can use more of it – much more of it, in fact. The presence of South American male tennis players used to be felt most acutely at Roland Garros. The likes of Guillermo Vilas, Andres Gomez, Gustavo Kuerten, and others made the year’s clay-court major a showcase for tennis talent from the non-Australian part of the Southern Hemisphere. The arrival of the latest Roland Garros tournament is a good time, then, to connect readers with an outlet that will shine a spotlight on South American players. BA Tennis World has carved out just such a presence on Twitter. This web resource will add to your understanding of (and exposure to) the global tennis scene. One of the best tennis pieces of 2014 was written by the author of the Fog Mountain tennis blog. If you want to dive into a given tennis issue, Fog Mountain Tennis is highly capable of giving you a layered and textured response. This is one of two exceptions to the “under-the-radar” nature of this Twitter list. It’s important for an audience of casual American sports fans to know where the best tennis-devoted writers reside. The best mainstream American tennis writer is Tignor, who writes for Tennis.com. Tignor is supremely skilled, but he also does a great job of engaging with readers on Twitter. Moreover, he often includes readers in his pieces – there are many examples of this inclusive style of tennis coverage. Tignor is a model in the industry for other writers to follow. Some – such as Courtney Nguyen of Sports Illustrated – do this as well. Tignor, though, sets the gold standard. A sometime contributor to Tennis.com and a former co-moderator of the message boards at that same website, Andrew Burton knows how tennis fans think. It’s one thing to possess knowledge about such a subject, though; it’s quite another matter to translate that kind of knowledge into an authoritative voice that can listen to and respect various competing viewpoints. Few people on Tennis Twitter are as patient in thinking and talking about tennis; Burton is extremely levelheaded and detailed in his analysis. He’s an unpaid commentator who, if he wanted to (and was asked by a network), could step into a booth and promptly become an excellent TV voice at a major. He’s partial to Roger Federer, but he’ll be the first person to tell you if Federer played poorly in a given situation. Burton’s best and most far-ranging piece of tennis analysis – though hardly his only one – is here. Plainly put, if you’re watching tennis on television at the majors, you’re going to be watching ESPN most of the time… and you’re going to do so even more in the near future. ESPN offers extensive coverage of all four majors, and beginning in 2015, it will offer exclusive coverage of the U.S. Open semifinals and championship matches, ending CBS’s 46-year relationship with the tournament. Chris Fowler and Mike Tirico are the ESPN tennis personalities casual American sports fans know the most, but if you want to follow ESPN’s best tennis commentator, it’s Cahill, and most tennis diehards would not argue with the claim. Cahill stays on point when talking about a match. His Australian identity gives him a perspective and a broadcast voice that’s different from his American ESPN colleagues. That same Australian background associates him with one of the foremost tennis nations in the world. That’s needed on a general level, but especially during the Australian Open every January. Cahill, who coached Andre Agassi in the latter stages of the icon’s career, knows tennis as fully as anyone on the planet. Yet, his analysis isn’t loaded down or clouded by jargon. He keeps his comments lucid and accessible, a great gift for any on-air sports analyst.